Supra Cat7+ cables are shielded and wide-bandwidth, (upto 1300 MHz) and are ideal if you have local data storage (such as a NAS box containing ripped CD's and/or DVD's) and you want to share music and especially video files around your home or office network. Each Cat7+ cable uses 8P8C terminations, allowing suitable hardware to benefit from all four twisted pairs of network cable. Using Cat7+ cables, with Gigabit type ethernet ports is a much faster way of sharing large data files, (compared to wifi) as firstly, you have a dedicated port that isn't going to be shared and secondly, wifi networks are not as speedy and there's more chance of interference and buffering as a result of other signals in the 2.4GHz or 5GHz band that might be sharing the same wifi channel. So, consider wiring Cat7+ cables from your router to your NAS box as a minimum...and then at least another Cat7+ from router to internet connected TV for watching Netflix in 4K, for instance) and then perhaps additional Cat7+ cables to your primary desktop PC(s). 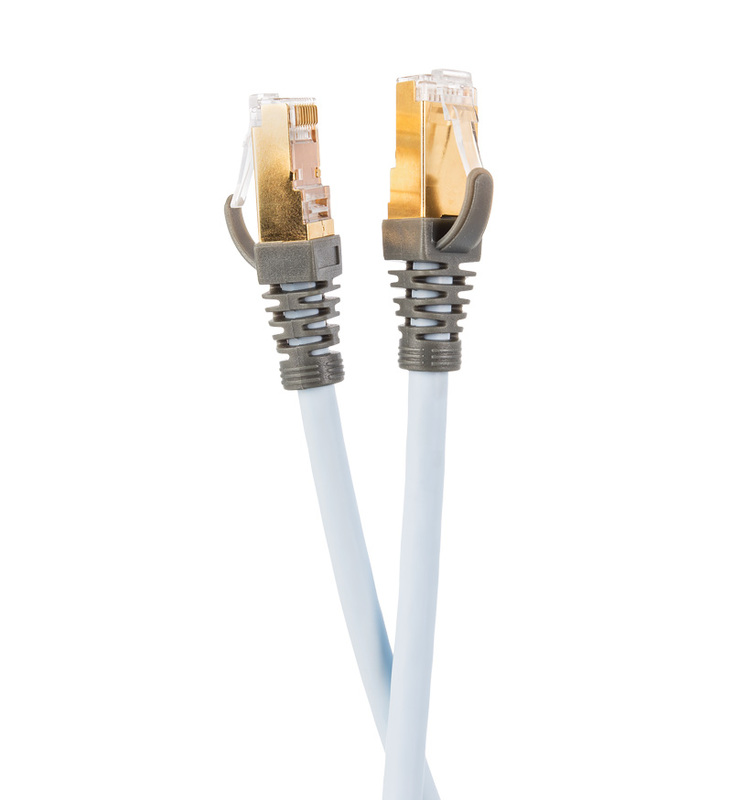 Supra Cat7+ cables are designed for maximising data throughput in both domestic and commercial environments, when used with matching 10Mb/100Mb/1000MB networking systems. Low insertion loss and both individual and overall shielding help to minimise losses, especially when used in data intensive applications, such as video streaming. In fact, these cables are ideal for connecting between NAS boxes, media servers, wired set top boxes (Roku, Humax etc), routers and internet connected TV's. For maximum data transfer, please use the Gigabit ethernet sockets provided on most newer equipments. 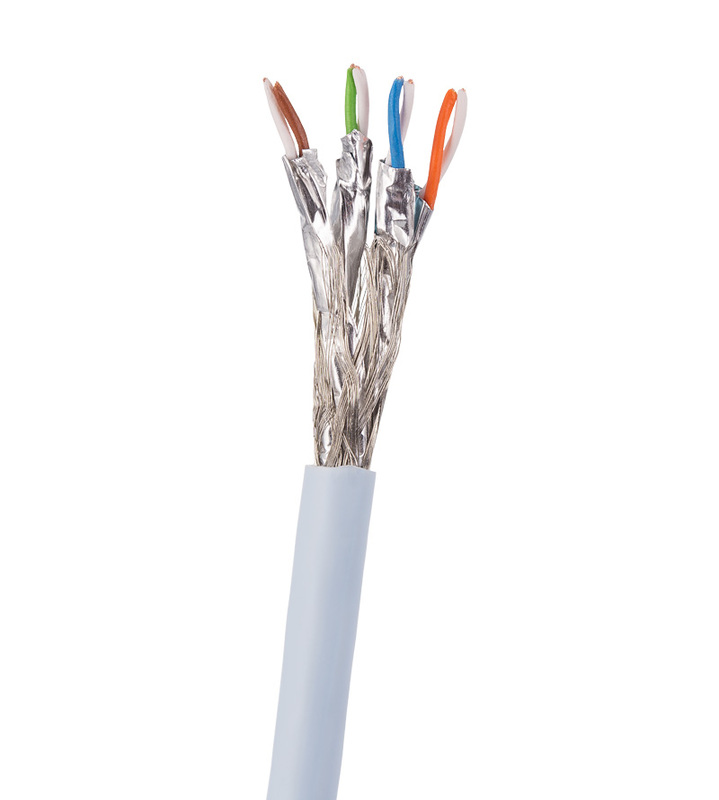 Using Supra Cat7+ shielded ethernet cables can help to maximise video, audio and data performance whilst streaming from your local network connected appliances. Supplied with factory terminated Supra gold-plated shielded RJ45 connectors. Excellent flame-retardancy, Halogen-Free, Low Smoke generation, Low Toxic gas emission. Better than Category 7A, according to EN 50288 and IEC 61156. Excellent NEXT, low attenuation, excellent screening characteristics (individual and overall screen), low SKEW, Bandwidth 1300 MHz (way better than the 600 MHz of most Cat 7 cable specifications). 8P/8C wired connectors as per T568B. Ethernet, TV, installation cable for generic cabling systems according to ISO/IEC 11801 and EN 50173 (2nd Edition). Ideal for all applications of classes D up to FA Multimedia (Video, data, voice) >10 GbE according to IEEE 802.3 AN, cable sharing, VoIP, PoE. from 0.5m up to 20m. 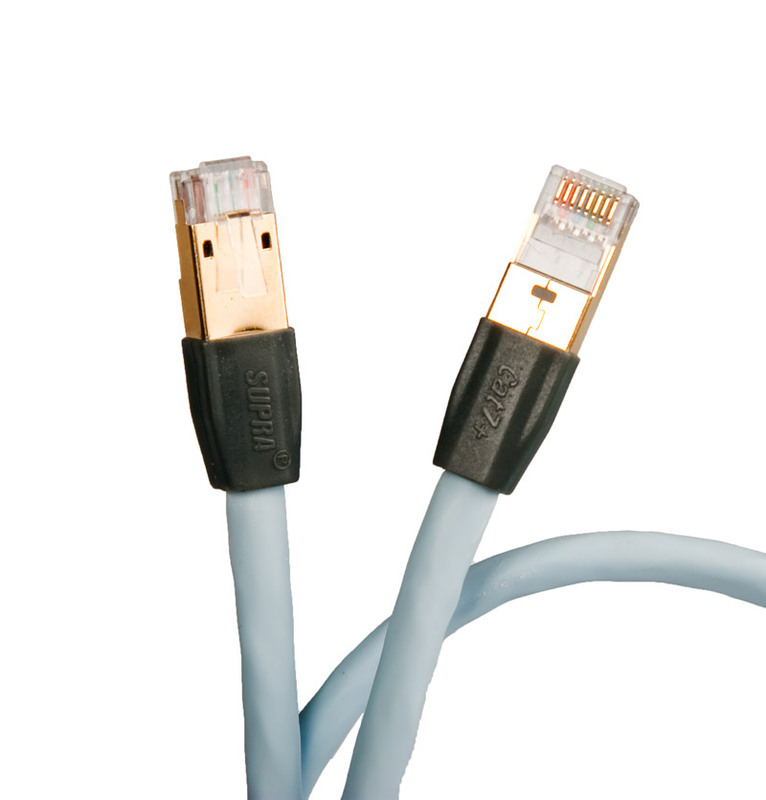 Supra Cat8 is one step ahead by providing a future proof cable supporting up to 40GBASE-T over a single cable. It is backwards compatible with standard Cat 6A. Supra Cat 8 is terminated with an improvement of the widely used RJ45 to be able to support the extreme performance that our cable provides. It ups the performance 4 times from Cat 6A with a bandwidth of 2000 MHz. Supra Cat 8 is used advantageously in TCP/IP and UDP application where correct data information is critical, e.g. 4K and 8K video streaming, high quality music streaming, gaming, data centres and in-building installations. By upping the performance 4 times to 2000 MHz you are more likely to have no incorrect data being sent or not being corrected by applications in time as there is much more bandwidth to work with. This can be very important to avoid for example video loss in streaming or avoiding stuttering in music streaming and voice communication. Supra Cat 8 is constructed with double shielding instead of single shielding to best avoid interference and in so data losses than can be critical to applications It is also ideal for Power over Ethernet (PoE) applications as it has larger copper cross-section than Cat 6A, meaning high power and less voltage drops. Assembled with Supra Cat 8 RJ45 male plugs. Standard lengths: 0.5m, 1m, 2m, 3m, 5m, 8m, 10m, 15m and 20m.